When I reviewed the first downloadable content (DLC) release for Marvel's Spider-Man on PlayStation 4, I guessed that all three scheduled releases would form a single grand adventure. "The Heist" focused on Spider-Man's ex-girlfriend Black Cat stealing from the Maggia, highlighting the pair's contentious relationship. It briefly touched upon Hammerhead, a member of the Maggia with an enhanced metal skull who wants to fill the power vacuum left behind by the Kingpin. At the time, I thought perhaps "Turf War" would be about Hammerhead himself. I was only half right. While Hammerhead appears here as the antagonist, the overall thrust of the DLC isn't about him. 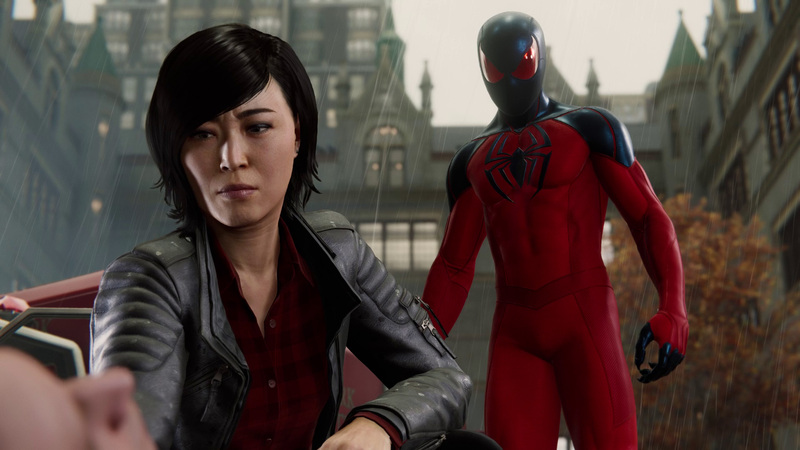 It's about another Spider-Man relationship, this time with police captain Yuriko Watanabe. Yuri and Spider-Man go through some things. In the comics, Watanabe is a police confidant of Spider-Man who eventually turns to violent vigilantism. She becomes the costumed anti-hero The Wraith, using stolen technology and Mr. Fear's gas to instigate fear in criminals. Turf War doesn't get Watanabe to that point, but it definitely starts her down that path. Hammerhead is just the inciting incident, causing enough chaos and pain to make Watanabe want to step outside the law. 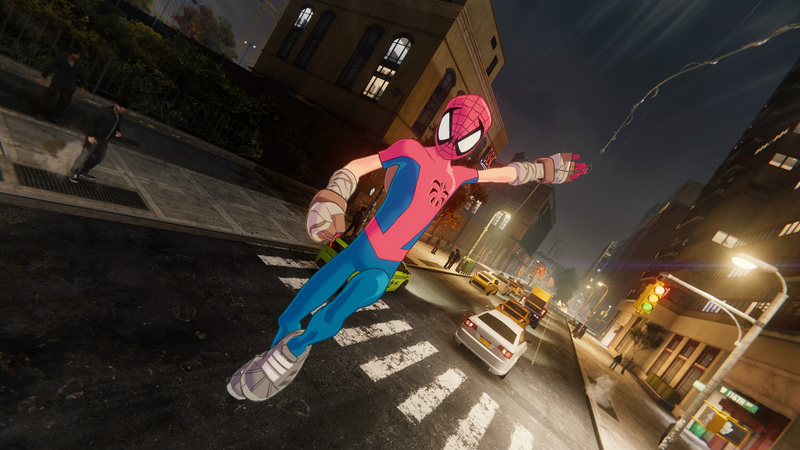 Like the first DLC, Turf War provides a spin on existing Spider-Man mechanics and lives in its own version of Manhattan. Crimes reappear here as Hammerhead crimes, some of which have you stopping open war between Hammerhead's goons and other Maggia, or protecting police motorcades with witnesses. Screwball is back again with new challenges in the combat and stealth categories. 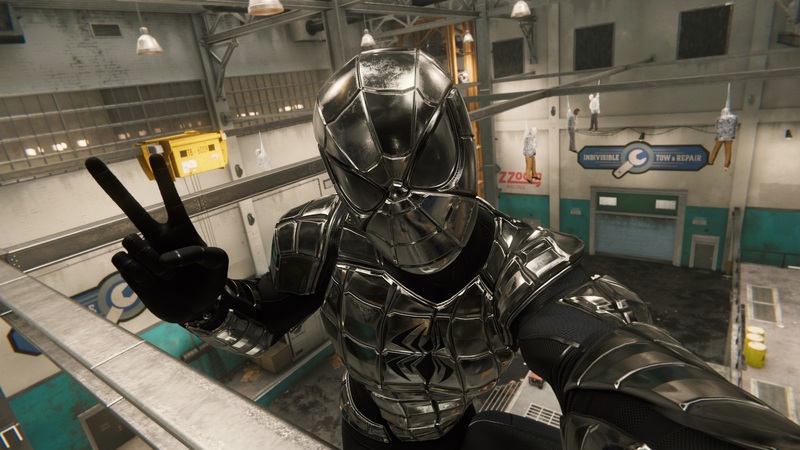 Combat challenges are much like they were in The Heist, forcing you to use a limited set of gadgets or defeat enemies within a certain shifting region for maximum points. 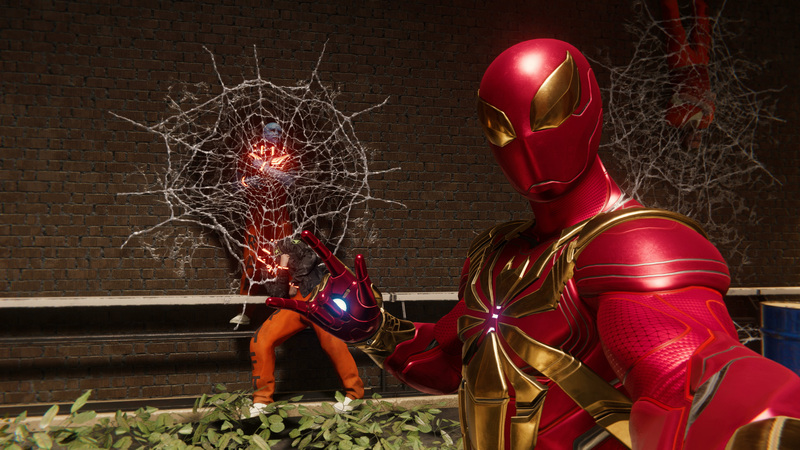 The costumes in this DLC. There's also a new take on the Taskmaster stealth challenges, with new motion detectors to trip you up. I like that idea, but the motion detectors' view cone could be a little more visible than it is. The cone is a soft blue light, which can be hard to read in in tandem with existing environmental lighting. I occasionally found myself stepping into their range because I couldn't tell a motion detector was facing in my direction. Neat idea, but it needs a little tweaking. Bases also return in the form of Hammerhead forts. As a highlight here, one base is in a renovated club; this not only provides some visual variety, but the layout is slightly different from the standard warehouses and docks in the base game. More of this in the Spider-Sequel, Insomniac! One of the new bases looks and plays different. On the flip side, Hammerhead bases are harder than previous versions. The basic construction remains the same: one stealth section, followed by five combat waves of increasing difficulty. What's changed are the new enemy types. The Minigun Heavy type returns from The Heist, joined by a version of the flying Silver Sable trooper with an all-new shield. Given this progression, I have to assume that the final DLC will have a flying Heavy with a minigun and shield. On their own, these enemies are just mildly annoying, but by the fifth wave, the Hammerhead bases will be throwing multiple Minigun heavies and flying shieldbearers at you, joined by criminals with heat-seeking rocket launchers, guns, stun batons, and electric whips. 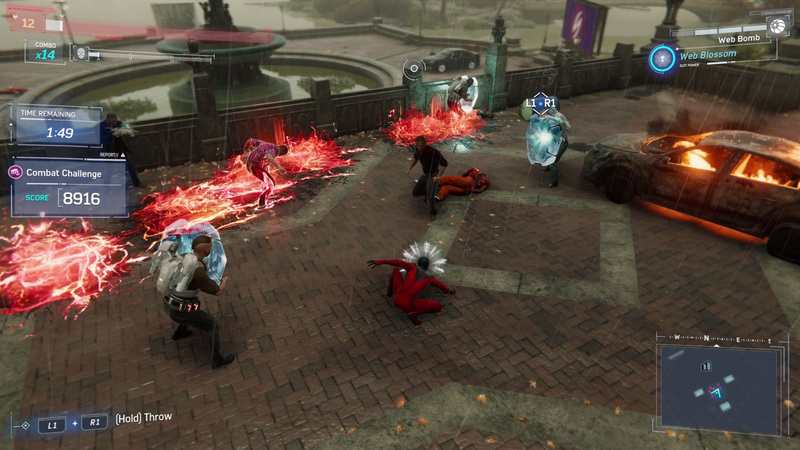 These bases are the hardest encounters I faced in Spider-Man to date; I got through them with the additional objectives complete, but I think some will find themselves frustrated. The game can throw a lot at you in combat encounters, especially with the new enemy types. 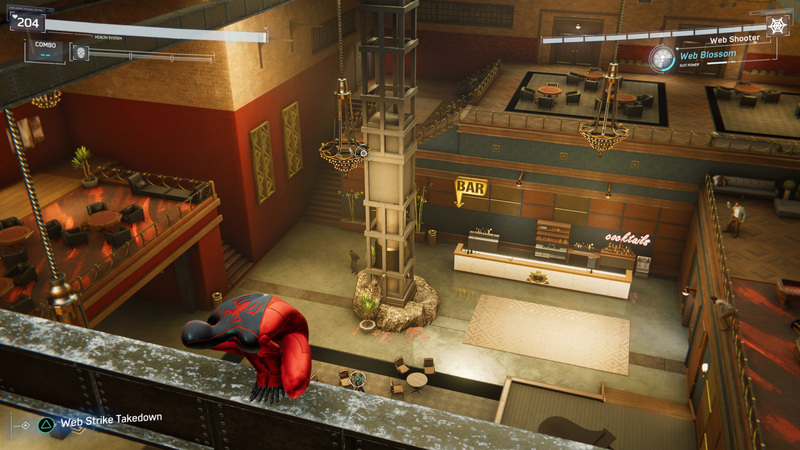 These new objectives only encompass four of the zones on Spider-Man's Manhattan: Harlem, Hell's Kitchen, the Upper West Side, and the Upper East Side. There's also no collectible this time around, making this release feel a bit slighter than the previous one. "Feel" is the operative word, as I 100-percented Turf War in just over three hours, around the same time it took me to complete The Heist. 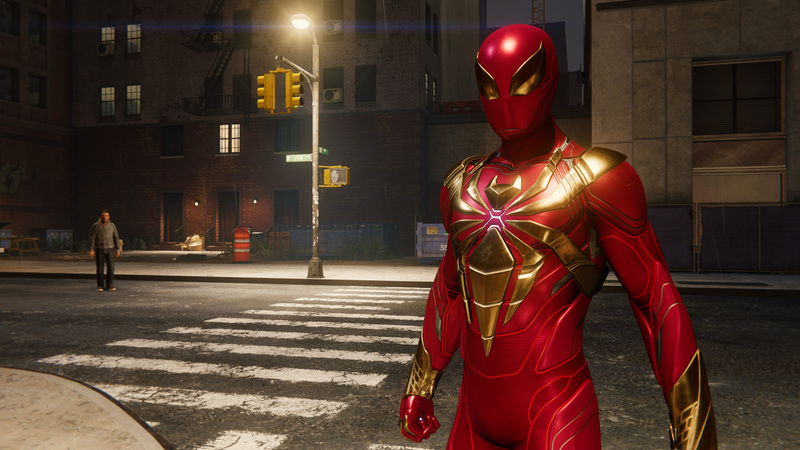 For your trouble, you'll unlock the Spider-Armor MK II after the first mission, the proper comic-accurate Iron Spider outfit once you finish the DLC, and the animated-style Spider-Clan outfit from Marvel Mangaverse: Spider-Man once you polish off all of the content. Like The Heist, Turf War is an okay addition to the overall package. Focusing on Yuriko Watanabe was probably a good choice and there's even some cute background conversations with Miles to keep you entertained. If you're up for the increased challenge of the combat, it'll give you three hours of continued Spider-Action. All told, it looks like "The City That Never Sleeps" is best seen as further "issues" in Insomniac's ongoing tale of Spider-Man instead of a complete story. Whether that's something you want is wholly dependent on how much Spider-Man for PlayStation 4 you're still hungry for. Tagged with Action,	Insomniac Games,	Marvel Entertainment,	PlayStation 4,	Reviews,	Sony Interactive Entertainment.